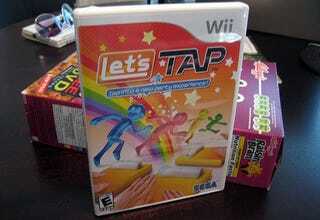 Sega and Prope's Let's Tap has shipped for the Wii, a mini-game compilation that requires players to lightly tap or firmly rap whatever surface the Wii Remote rests upon. Sadly, Sega did not provide North American consumers with cardboard boxes. They're still on the cover, mind you, taunting us with their gorgeously orange hexahedral shapes, a perfect platform on which to lay one's Wii Remote and tap, tap, tap away. They got 'em in Japan and they're getting 'em in Europe, but North American customers will have to make do with a DIY solution. Mine will be a gutted box of Kellogg's Raisin Bran. Sega is offering, via Best Buy, an exclusive "tapping pad" for Let's Tap, one that the Giant Bomb boys went tips-on with today. They also have a few creative solutions for official cardboard box replacements, should you not yet be ready to repurpose a box of Boo Berry or Frosted Flakes to get your mini-game fix. Expect our Let's Tap review later this week.